In Minnesota the process for extracting the iron from the taconite began in the 1920’s with a first plant that didn’t survive long. 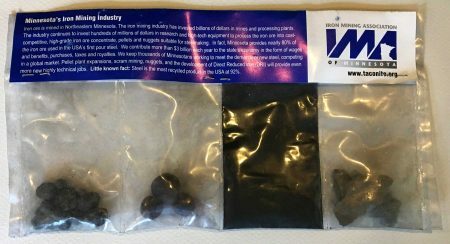 The process to produce the taconite pellets that many people are familiar with today involves crushing the taconite rock into powder, extracting the iron and then forming the pellets that can be used in the furnaces. 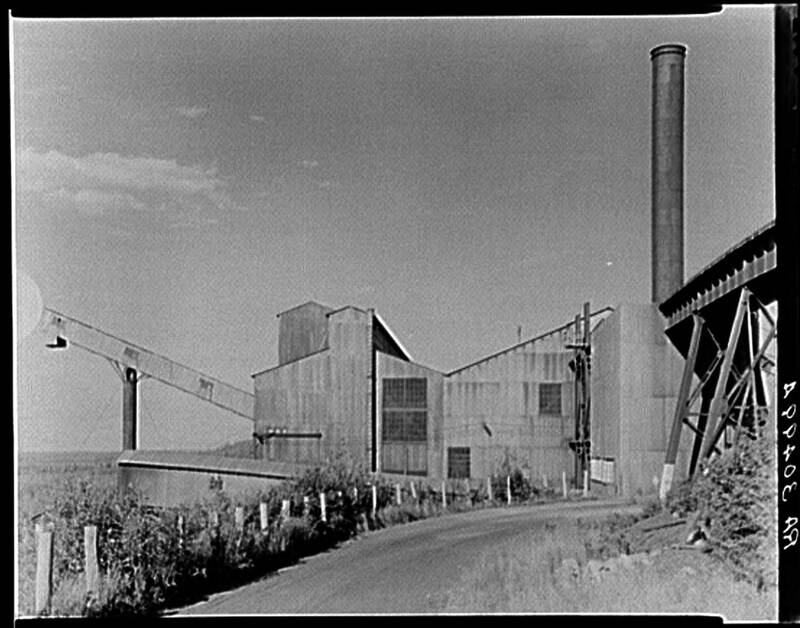 The next plant was Reserve Mining (now Northshore Mining) followed by Erie Mining (to become LTV Steel Mining, now closed). US Steel also experimented in the 1950’s with their Pilotac and Extaca facilities. All of these plants are on the eastern end of Minnesota’s great Mesabi Iron Range, which is served mostly by the Duluth Missabe & Iron Range railways. 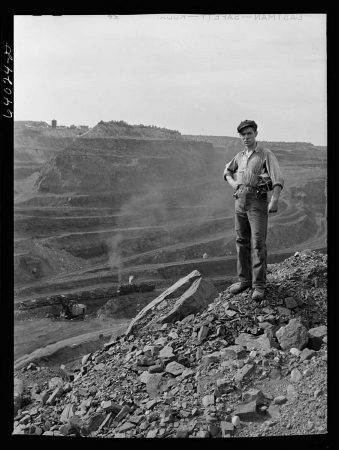 Finally in the mid 1960’s a taconite pellet plant opened on the Western Mesabi, in Great Northern territory. 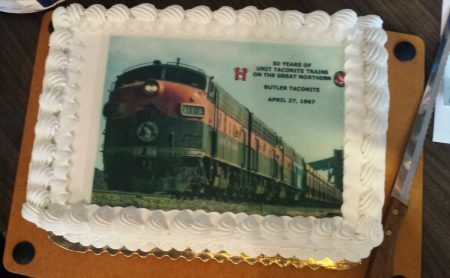 On March 27, 1967, the Great Northern operated its first unit taconite train from its dockside “Allouez” yard in Superior, WI to Butler Taconite near Pengilly, MN, and returning to Allouez. I’m modeling that western end of the Mesabi Range and including both the Great Northern and the westernmost extension of the DM&IR. The location of the spur from Butler Taconite’s loading track to the mainline is just outside of my modeled territory. But the real taconite trains took a counter-clockwise journey across the GN and so the loaded train traversed the territory that I’m modeling. I’m modeling the GN based upon the employee timetable, modeling the locations and schedules to reproduce the operation of 1958. The reasons for choosing 1958 could be a separate article. But for an anniversary such as the 50th of the first unit taconite train, changes were made for a special operating session to commemorate the anniversary. In the summer of 1958 the GN was using timetable number 69 on April 27, 1958. 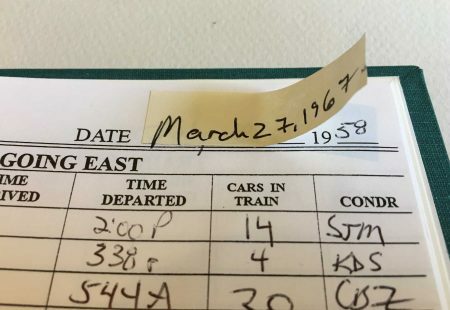 In March of 1967 timetable 93 issued on October 30, 1966, was in effect. The general configuration of the territory was the same between the two timetables, but the subdivisions were rearranged and one modeled subdivision was removed in 1959 when CTC was introduced. The timetable used in my normal 1958 operating sessions has timetable pages that I typeset to look as close as possible to the prototype employee timetable, but with shading used to indicate portions of the railroad that weren’t modeled. The special instructions in effect are the actual 1958 special instructions. For the special session’s timetable 93 I used a direct copy of the ETT with no changes – I figured that the crew was familiar enough with the railroad to not stumble over any discrepancies. I couldn’t quickly install CTC to transform my timetable and train order railroad into a CTC railroad. I considered using paper signals as described in the April 2017 Model Railroader article by Bruce Carpenter, but my dispatcher wasn’t very interested in running around placing signals. CTC didn’t encompass the entire territory that I’m modeling, so there would still be the need for a train order operator. Bulletins were posted to state that the CTC was not in effect, and to reinstate the job of operator at two locations that did not have operators in 1967. 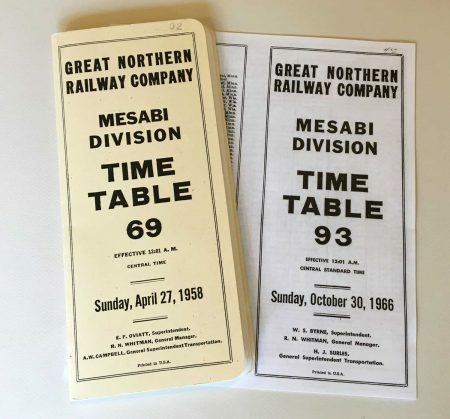 In 1958 the employee timetable has several scheduled trains and there were still overnight passenger trains from Duluth to Grand Forks. By 1967 all trains were run as extras. In general the same industries were working although specific mines that I’m modeling didn’t ship any ore in 1967 so all ore cars were temporarily removed from them. I made a few small changes to the physical plant to support the operation. I have three locations where the prototype had spring switches. I don’t have working spring switches but instead paint the ground throws white and I tell the crew to line them for their movement. In 1967 these spring switches were all removed, so I repainted the ground throws. Also while I reinstated two operators, I also closed two other offices that were closed by 1967. 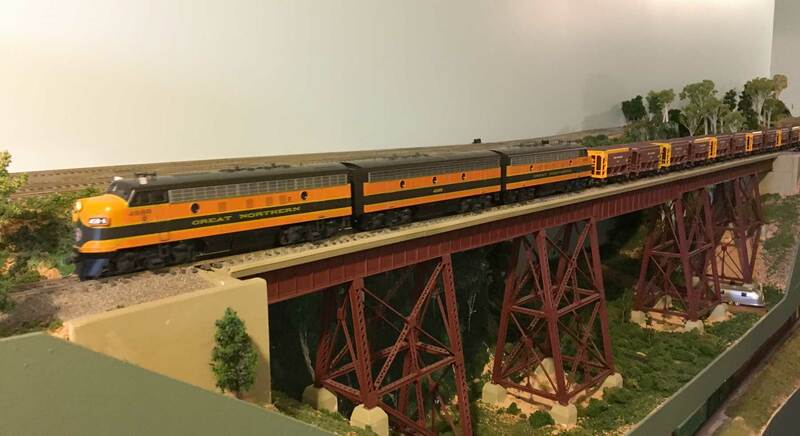 I’ve been planning on holding a special session for this anniversary for the past 24 years, or maybe I started right after my special session on my old railroad (see Model Railroad Planning 2011) for the 25th anniversary. 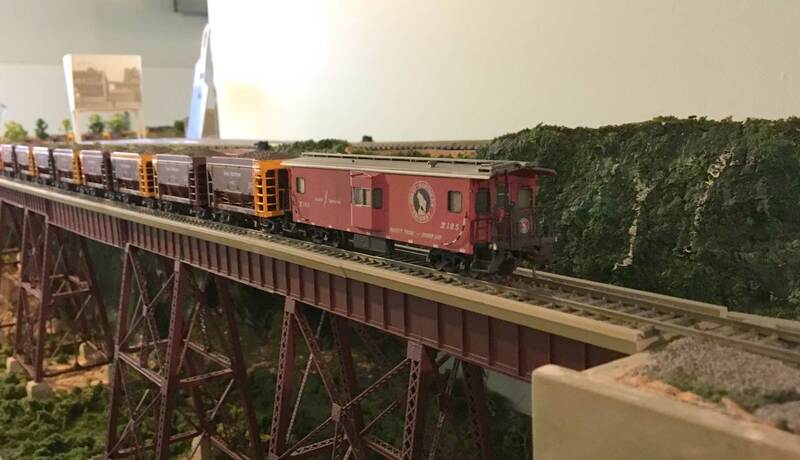 I host regular operating sessions with Chicago’s RailGroup and an occasional weekend session. I thought this commemorate session should be a special session. I cautioned the crew that they might have to double up (so that more could attend), but that there would be cake. The final markup provided a full crew of 12 people. I gave the GN yardmaster at Gunn Yard (see Layout Design Journal 55) additional responsibilities on the DM&IR because I expected that that the Gunn job would be a little slow. Two daytime locals ran. One was the normal Kelly Lake Local from Kelly Lake to Gunn. The other local, on the mainline, was given all the work as though the schedule had switched from daily-each way locals in 1958 to out one day back the next locals in 1967, which I think was a reasonable change. Trucks handled all LCL in 1967. 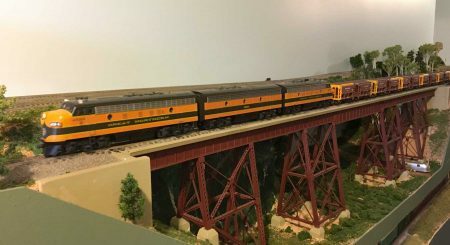 The Butler Taconite train was preceded to Calumet (the station west of the plant) by an executive special with a ranch lounge car and the Mesabi Division superintendent’s car. The honored guests were bussed to the plant to observe loading after which they reboarded their train and followed the taconite train to Allouez (staging). The taconite train was scheduled to depart the plant at 11:30 am. It departed at 11:48 am, arriving Gunn, the mainline junction, at 12:02 pm. And the clock was stopped to enjoy the celebratory cake and coffee. The crew spent the time between bites of cake asking questions about the taconite and the demise of natural iron production. After about 30 minutes the clock was on with the taconite train arriving Allouez staging at 1:00 pm. 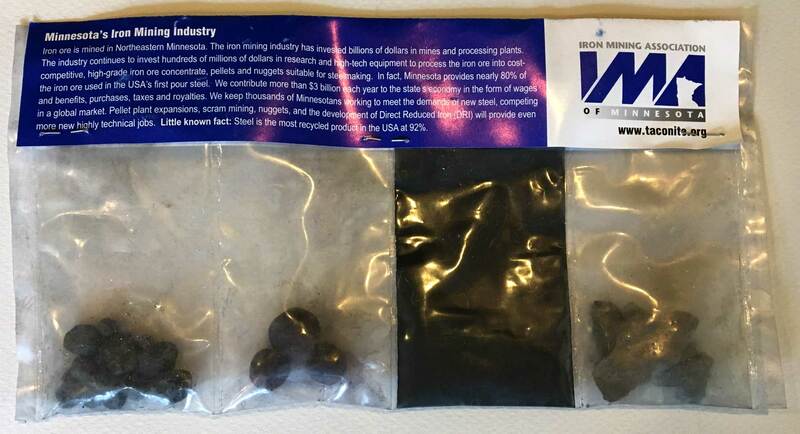 The crew was all invited to take home their copy of timetable 93 and a sample from the Iron Mining Association that provides examples of raw ore, concentrate, pellets and nuggets. I’m now in the process of removing the Post-It tape covers I placed over all the dates (in registers, train order book, train sheets) and rehanging the correct bulletins for 1958. 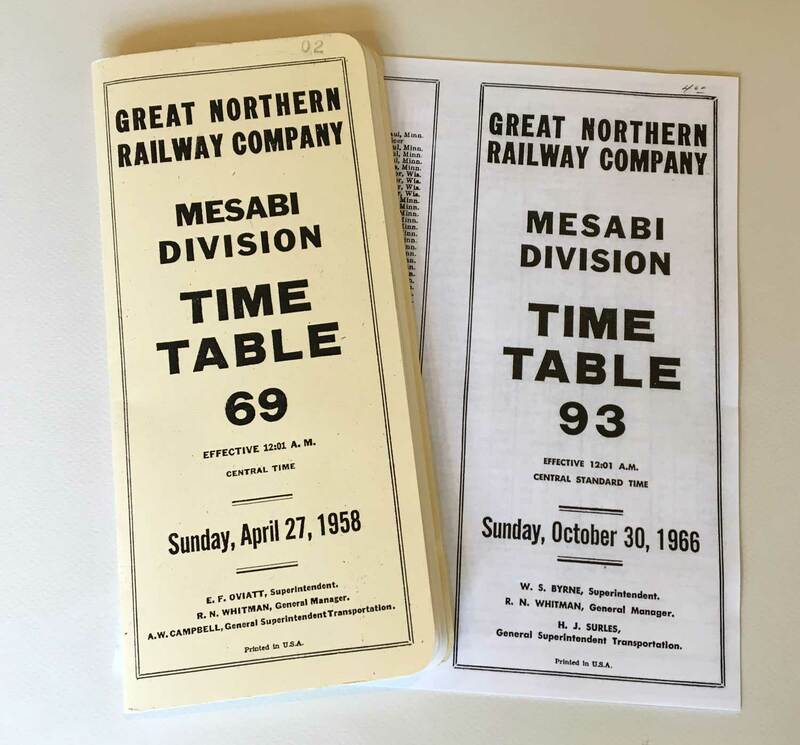 The railroad will once again return to 1958 with its six mines and one concentrator all shipping ore from the west end of the mighty Mesabi. Thanks to Ed Klein, John Goodhart, and Chris Czyzewski for helping to plan and execute this special event session. Wow, thank you for sharing details on a very interesting special operating session, Bob! Awesome read Bob! Glad to be of assistance. Eric, thank you for posting this. Bob, absolutely wonderful session, and it was an absolute pleasure to have participated. Not one of your sessions goes by that I don’t learn something. This one was especially educational. Great effort and article Bob! Eric, thanks for posting. All the attention to detail shows your extensive knowledge of the prototype. You inspire the rest of us to do better. Great Stuff Bob. Please tell us about your F-units, I love F’s.